Growing projects are a unique way for Canadians to support the work of PWS&D and Canadian Foodgrains Bank (CFGB) to end global hunger. 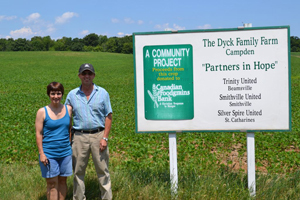 Larry and Marg Dyck in Beamsville have been strong CFGB advocates for 16 years and are currently donating 90 acres of their land to three growing projects supported by Trinity United, Smithville United and Silver Spire United churches. Growing projects typically involve a group of people working together to farm a common plot of land that will be harvested and the proceeds donated for overseas food aid and agricultural development projects. Several congregations may join together. Urban congregations wanting to participate in a growing project partner with rural congregations by providing funds for inputs, or by donating to the project’s overall fundraising goal. Local businesses can also help by donating farm inputs. At the root of growing projects is a deep generosity and unwavering commitment by many to help other people in need. Growing projects are the accomplishments of many individuals, congregations, communities, landowners and suppliers, all working together with the common goal of ending global hunger. Thanks to this support from Canada, families in impoverished communities around the world are journeying towards food security, ensuring there is food for today and tomorrow. Click here to visit Canadian Foodgrains Bank website and read more about how you can get started.